Sundal is the stir fried legumes of your choice. 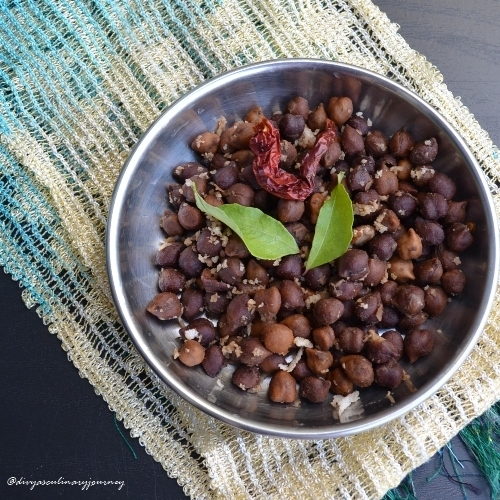 It is a must have for any festival or offering to God .It can be made with chick peas, peas, channa dhal etc., It is simple and easy to make. It makes a healthy snack too. I made this sundal for Vinayagar Chathurthi. Soak the chickpeas for 5-6 hours, preferably overnight. Then pressure cook the chickpeas for 3-4 whistles. Then let the pressure release, drain the water and set the cooked chick peas aside. Heat oil in a skillet, add mustard seeds, when they crack add red chillies, curry leaves and fry for a minute or two, then add asofoetida, cooked chickpeas, salt to taste and mix well. Cook this for a minute or two, then remove from heat add the grated coconut, mix well and serve. While eating as a snack, onion can also be used. But usually while offering to God, we avoid garlic and Onion. For variation, u can add grated ginger too. Fry the grated ginger with other ingredients and proceed. Red chillies can be replaced by green chillies too. Nutritious and definitely a healthy sundal,simply love it. 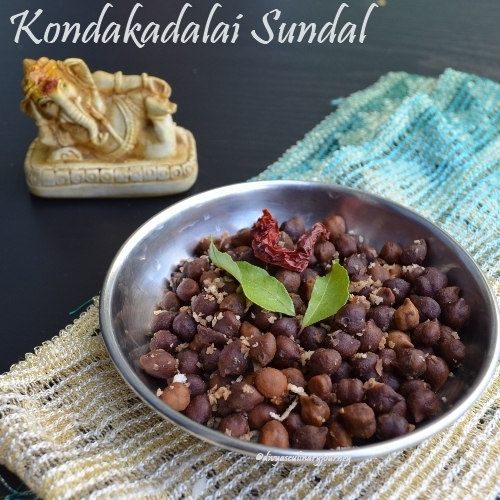 Love this black chickpea sundal, I make with more coconut. Chickpeas are high in protein, nice recipe. Healthy sundal and I love the little ganesha posing. Nice.